I am the devourer of worlds. 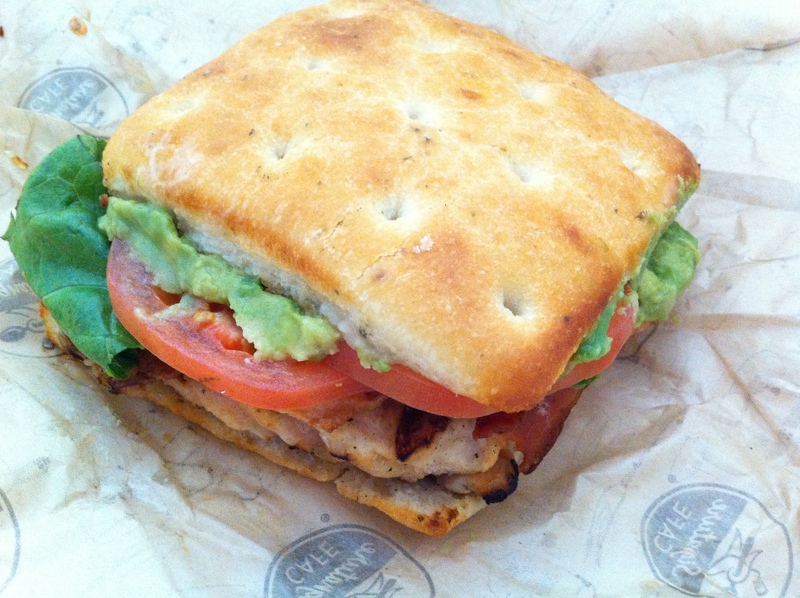 There are times when the sandwich you eat is the perfect sandwich. There are also times when the sandwich you eat is the perfect sandwich for that particular time or occasion. This offering from the La Brea Bakery was possibly both. Recently re-opened just outside of the gates of Disney’s California Adventure, the La Brea Bakery is, naturally, known for its fresh-baked bread. When I saw that one of its items was served on a pretzel roll, I did not hesitate. My adoration for the pretzel roll is, I believe, well-documented on this site. 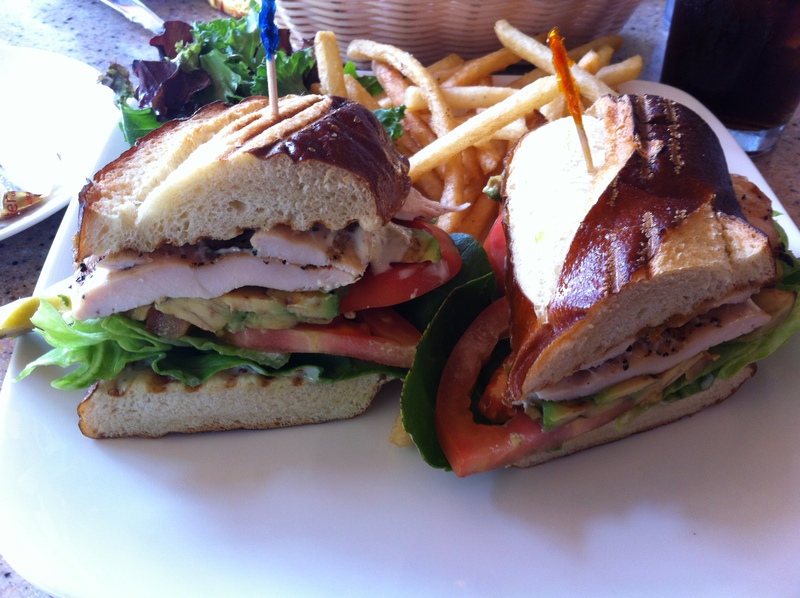 The sandwich — grilled chicken, butter leaf lettuce, avocado, tomato, and aioli — was fantastic. It was far better than the sum of its parts and its crowing achievement was the pretzel roll, enhancing everything contained therein. 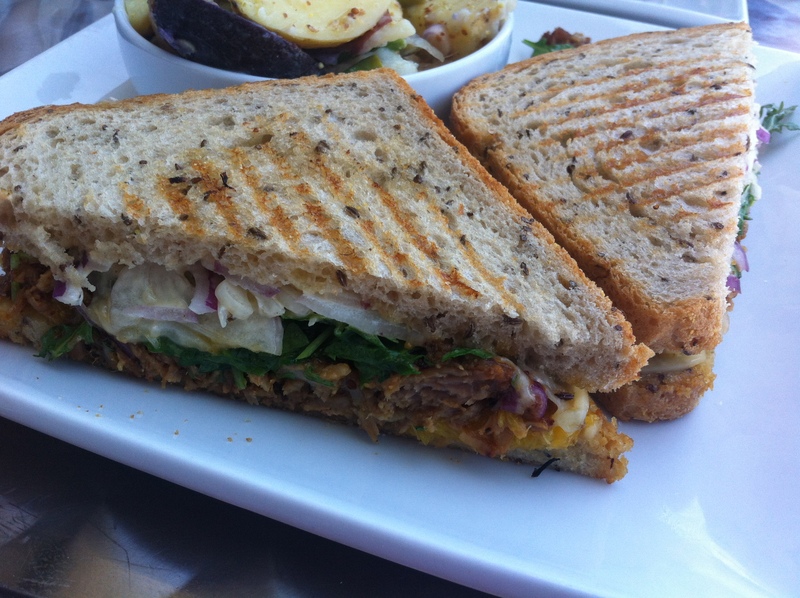 Even the inclusion of butter leaf over some of the more preeminent staples of sandwich lettuce was an inspired choice. As I had recently experienced at the Village Bakery and Cafe, the decision to slice the grilled chicken rather than present a complete, boring grilled chicken breast was once again the most correct decision that could have been made. If there was one problem with this sandwich, it was that there was an unusually high amount of filling creep. But even as by sandwich became messier with each bite, I still marveled at the pleasure derived from eating it. The La Brea Bakery provided me with an unexpected treat on day I sorely needed one. The Chipotle Chicken was a very satisfying sandwich that was well worth my time. The sauce was flavorful and not overpowering and the delicious bun both enhanced the experience and masterfully curtailed any danger of filling creep. The true triumph of this sandwich, however, was the simple fact that the chicken was cut into slices. Not deli-thin slices that would more properly called cold cuts, but perhaps twice-filleted and grilled hunks that fitted together to make for a pleasing experience, both in terms of flavor and of texture. Far too many establishments provide one massive chicken breast flopped from the grill onto a bun and call it a day. Not here. The chicken is purposefully carved and assembled to make for a more pleasing experience. Mission accomplished. 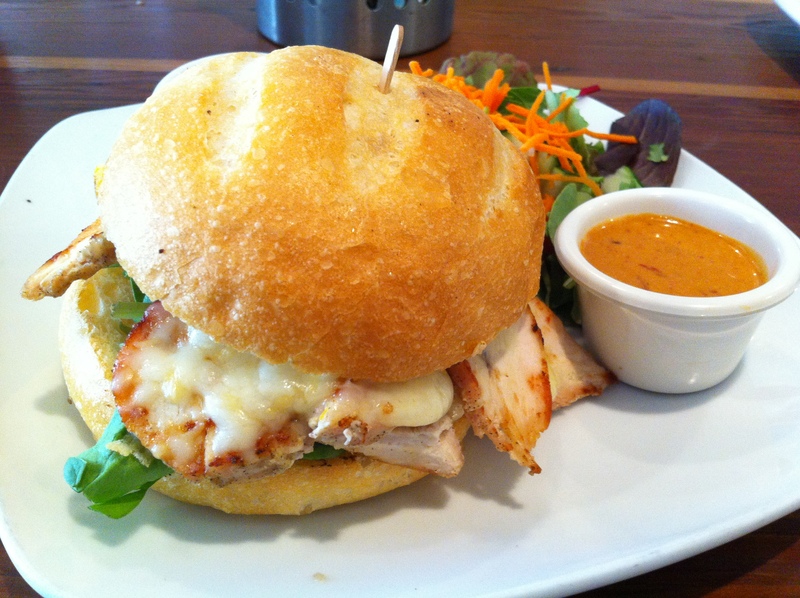 It is a simple step and creates a world of difference from the standard chicken breast sandwich. Preferable every time. Unlike our esteemed founder, I have no such qualms about the presence of bacon. Although I wholeheartedly agree that the fixation on bacon is hackneyed, unnecessary, and already hopelessly cliche, I do enjoy a bit of smoky, salty substance added to sandwiches every now and then. And of course, within a BLT, its presence is mandatory; otherwise you would just be silly. I attempted to create a pair of sandwiches at home using some roasted garlic bread obtained by my closest associate. 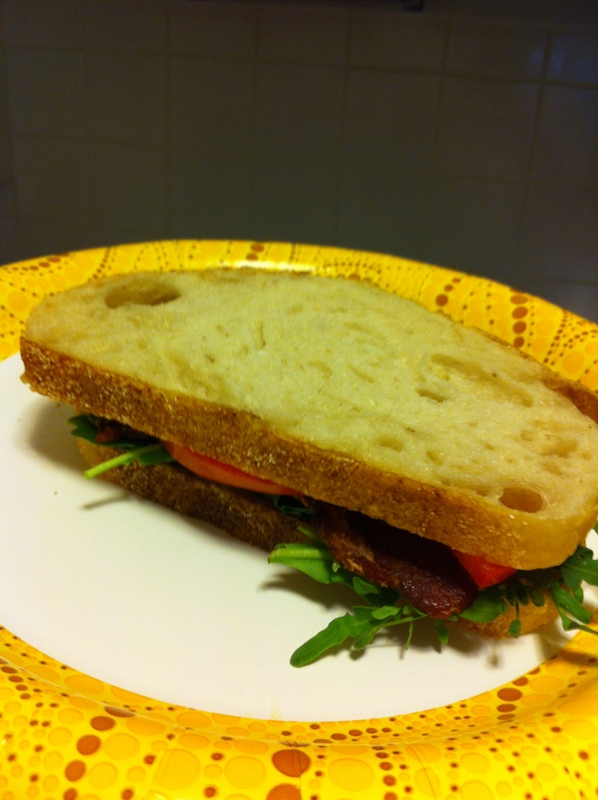 The first attempt, the simple BLT with tomato, arugula, and mustard, was underwhelming. This was solely my own fault, as I accidentally used far too liberal an application of mustard and overwhelmed the whole of the sandwich as a result. My second attempt was miles better. For this second sandwich I went lighter on the mustard, used just one strip of bacon and added peppered sliced turkey breast. 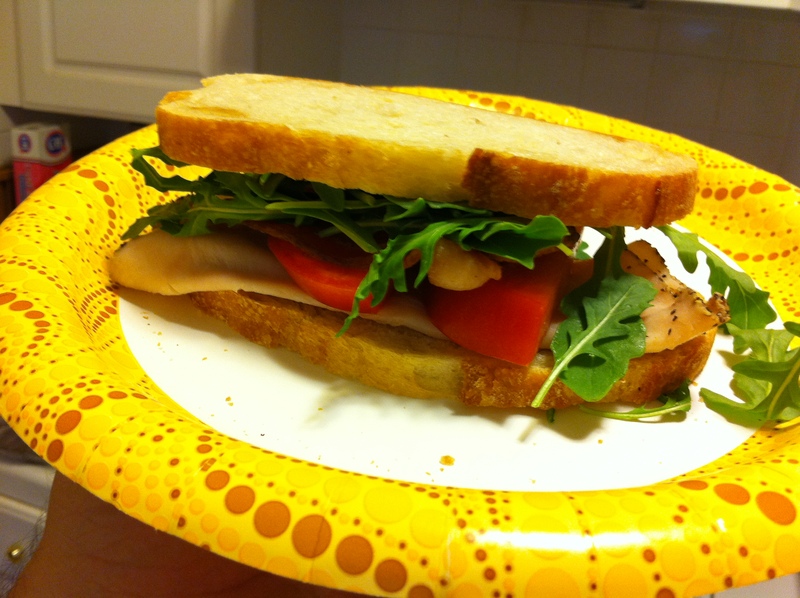 The result was a flavorful and refreshing sandwich. The peppered turkey really sang and was pleasantly augmented by a minimum amount of bacon and mustard. The bread — with cloves of garlic baked in — matched up immensely better with the turkey than without. When discussing sandwich meats, let us not overlook our dear friend the turkey, which — much like vodka in mixed drinks — can often become anything a sandwich requires. It is the most malleable of sandwich meats, which is a feature to be admired, rather than derided. The made-to-order supermarket deli sandwich is, of course, something we have examined many times before at On Sandwiches. Today we explore another and question two things: storage and application of avocado, and abundance of the “large” sandwich. The second point I want to address here is at what point offering a “large” sandwich becomes unnecessary. What you see above is a perfectly acceptable sandwich. Unfortunately, I ordered a “large” version of this sandwich, which — due to the nature of the focaccia bread on which it is served — resulted in the counter employee simply making two of the above sandwich and wrapping them separately. I would argue that this is not a large sandwich. This is, in fact, two of the same sandwich. Again, perhaps I am a stickler of semantics here, but these are not the same thing. The sandwich(es) was (were) actually quite good. Nothing revolutionary, of course, but all the flavors married well and added up to a satisfying experience. And then, of course, I had to eat another sandwich. In sandwiches, as concerns most others things in life, it is not often necessary to try to gimmick up a sure-fire winner. If you must have your dalliances and whimsy, either work out your quirks in the comfort of your own home, or make your entire enterprise reflect that you are not to be taken seriously with regard to the art of the sandwich. Four Cafe is a fine establishment, serving fresh fare with plenty of vegan and vegetarian options and with an eye toward healthful menu items. They have a seasonal menu and some of their winter offerings were quite spectacular indeed. Unfortunately, it is now spring, and they are featuring a pulled pork sandwich that does grave disservice to the genre. You called it a “Slow Roasted Pork” sandwich, Four Cafe. Don’t hand me nothing but citrus and call it a day. It is safe to say that the making of a sandwich into a “______ grilled cheese” or “grilled cheese ________” is, in most instances in 2012, a tawdry gimmick. The “gourmet grilled cheese” sandwich has been played out to the point of near-absurdity in recent years, with many a food truck, sandwich counter, and would-be fine-dining establishment endeavoring to put on airs and reach a clientele by offering an approachable item under the pretense that their sandwich is a Michelin-star spin on the ubiquitous and universal grilled cheese. Usually, these offerings are nothing more than a grilled cheese sandwich with a bunch of “unusual” ingredients thrown in, merely for the sake of things. There is rarely thought involved beyond, “Wouldn’t it be interesting if a grilled cheese sandwich included ______.” The answer these establishments don’t want to hear, however, is that it usually isn’t. This is all a long-winded means of introduction to a sandwich that is anything but a gimmick. The short rib grilled cheese from Four Cafe is a grilled cheese sandwich only by the default of the literal interpretation of its method of preparation. This sandwich was an endless delight, and would have been none more so had the appending “grilled cheese” been stripped from the board altogether. The pulled and braised beef short ribs were flavorful and moist, but pleasingly firm. The red onions, softened by the grilling, added a pleasing, but not overwhelming snap and brought a welcome addition to the flavor palate. The gruyere cheese was the perfect component to fasten everything together and add texture and oil to the endeavor. The focaccia bread was the perfect container and was indeed grilled to perfection. It all added up to a sandwich that was a true delight to savor. If the sandwich had a fault — and I don’t believe it did — it would be that the ingredients of the sandwich were purported to include horseradish, although none was significantly detectable. 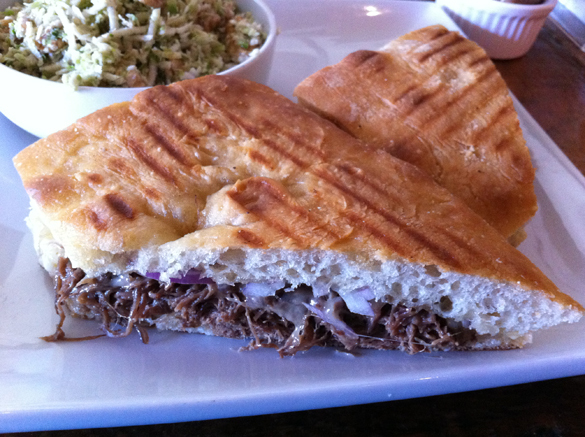 It may have been overwhelmed by the gruyere, or it may have become a part of the short rib. Either way, its presence was not missed in the slightest. This item is a part of the Winter Menu at Four Cafe. I will do everything in my power to sample it again in the coming weeks, for fear that it will no longer be on offer when the spring rolls around. I am a firm believer that one should never judge an establishment by one bad experience. In nearly all situations, a bad sandwich can be excused by any number of things, and the other items on offer might be superior. Unfortunately, if you keep going back to the same sub-par establishment in hopes they will impress you the next time can sometimes leave you feeling like a fool. It is a dicey proposition. I endeavored to try out another item at Johny’s Kitchen, feeling that, since they had so many sandwiches on offer, my previous horrible breakfast sandwich experience was perhaps an anomaly. I selected (as is my custom) the most intriguing menu item. In this case, the Malibu Chicken. Advertised as “breaded chicken,” ham, and Swiss cheese on my choice of bread, I placed my order and was not asked a bread preference. 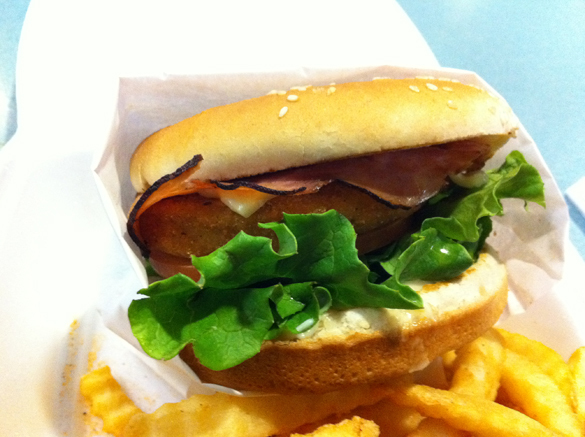 Thus, I received a deep-fried frozen chicken patty, a slice of ham thrown upon a grill while the patty fried, tomato, lettuce, and mayonnaise on a sesame seed bun. I have been having bad luck with bland sandwiches as of late, so we can add another one to that list. The patty was flavorless, there was too much lettuce, and the cheese, mayo and one thin slice of ham were indistinguishable from one another and hardly detectable. Malibu chicken, not in its sandwich form, is a spin on chicken cordon bleu; a means of making a gourmet dish approachable. In that respect, this sandwich is appropriately named. This is a low-class sandwich for a palate so undiscerning as to become negligible. Pete’s Blue Chip on Colorado Boulevard in Eagle Rock is a curious establishment. Situated awkwardly, seemingly run-down and with a bizarre menu, it took me an exceedingly long time to figure out which sandwich to order. 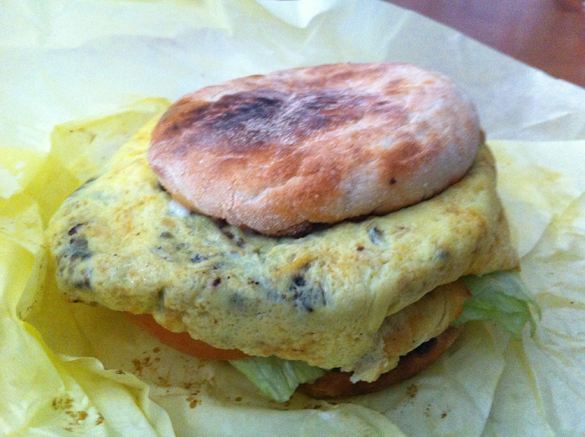 I decided at last upon the hamburger and egg sandwich, and after having consumed it, I am no less puzzled. The hamburger and egg sandwich — and it is a sandwich, as it comes on your choice of bread, with “bun” not being an option; that is a separate section of the menu — is a strange creation indeed, at least the one that was constructed for me that day. The sandwich consisted of a thin hamburger patty, an enormous quantity of scrambled eggs, iceberg lettuce, a dollop of mayonnaise and a truly gargantuan slice of tomato on an English muffin. In the eating, it was exceedingly and perhaps a bit unsurprisingly bland. Not nearly so bland as my egg-and-little-else sandwich from some time ago, but quite bland, indeed. The strange thing about this sandwich is that so much could have gone right were any of the ingredients swapped out for another. Were the hamburger patty instead a sausage patty; were the lettuce or tomato instead red onion; were the mayonnaise instead Dijon or stone-ground mustard; were the eggs fried rather than scrambled…any of these would have represented an exponential upgrade in both flavor and quality. The concept had unlimited potential. With just one small tweak, this sandwich could have come close to living up to that potential. The River Belle Terrace is located on the border of Frontierland and New Orleans Square in Disneyland and features a few different sandwiches on offer. 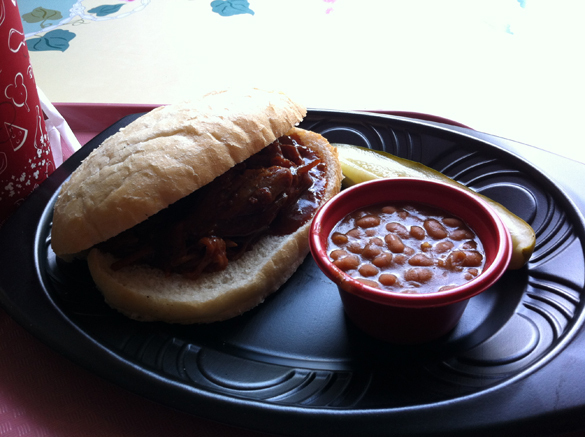 The Tennessee BBQ Pork is pulled pork in a thick BBQ sauce served on a soft white roll. It comes with a plastic cup of beans and your choice of cold salad. The pork is tasty enough, with the sauce being about as appetizing as your average inoffensive BBQ sauce. The bread is spongy and unexceptional but holds the contents adequately. It isn’t a chore to eat, isn’t stale and can definitely hit the spot. Anywhere else in the world, this would be a mediocre, unexceptional or even disappointing sandwich. As far as Disneyland sandwiches go (and I have had my fair share), it is above-average. It does not approach the Monte Cristo at the Blue Bayou or the small offerings available during the food and wine festival at Disney’s California Adventure, but if you are at the park and in need of a bite, it will more than suffice. I have written about Dave’s Chillin’ & Grillin’ before. The Boston transplant has an affinity for pepper spread and unorthodox creations, so I was not surprised when he recommended an off-menu item when I stopped in one January afternoon. “The Hodge-Podge,” as he fittingly has titled it, is just that. 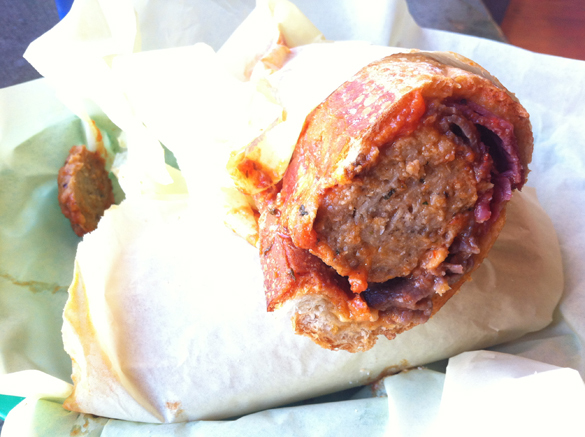 The sandwich is, at its base, a meatball sub, which Dave creates with aplomb (and, of course, with pepper spread). To this, he adds pastrami and roast beef, both sliced thin, and the Hodge-Podge is born. I admit, I expected this to be a mere gimmick, with the sliced meat disappearing into the meatball sub. To my delight, the pastrami and roast beef added welcome layers of both flavor and texture. The result was not quite a reinvention of the meatball sub, but a lovely alternative. Normally, things that are not broken do not need fixing. But one should always keep an open mind about putting a new spin on them.